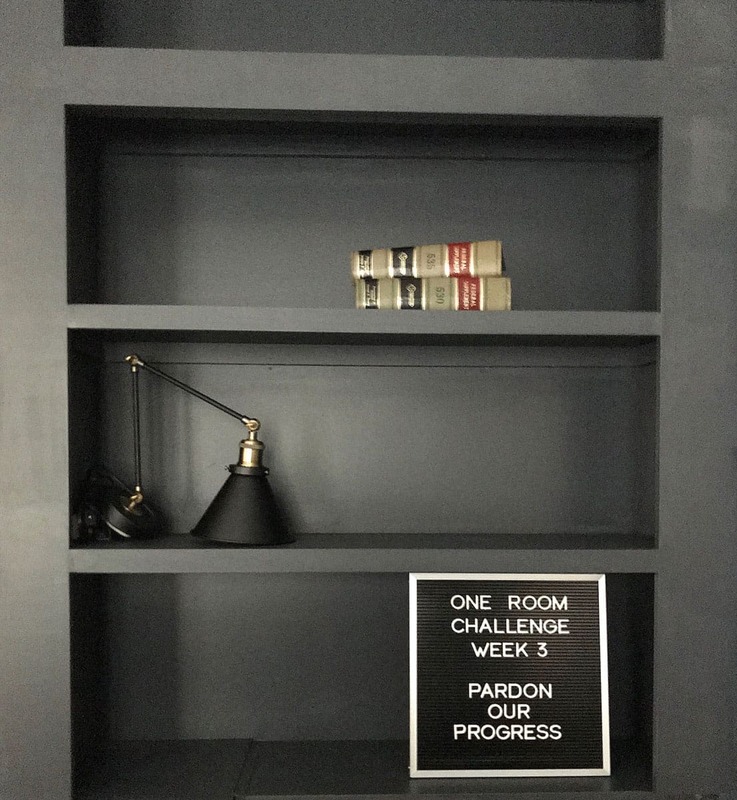 Welcome back to this week’s One Room Challenge update. I actually have some progress to report on this week 3 of the challenge. Let’s start with the good stuff. This is where we ended up at the end of the day on Wednesday. The library wall is structurally complete and painted, even thought the doors on the cabinets still need to be attached. 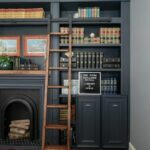 If all goes as planned, I hope the entire wall and fireplace surround will be framed in beautiful finish moulding from Metrie. Even as great as this looks, I know from past experience what an impact interior finishes can have on a space. Check out our master bathroom ORC from Fall of 2016 for the ultimate in finishing details. Click here. Now let’s go back in time…. 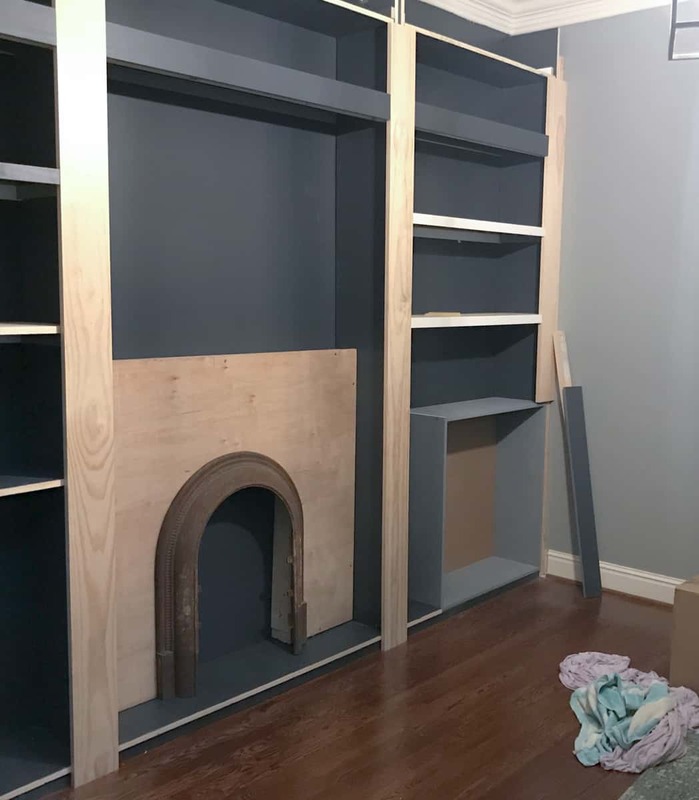 In addition to completing the build of the bookcase wall, we began building the base of the faux fireplace for a more realistic set back. 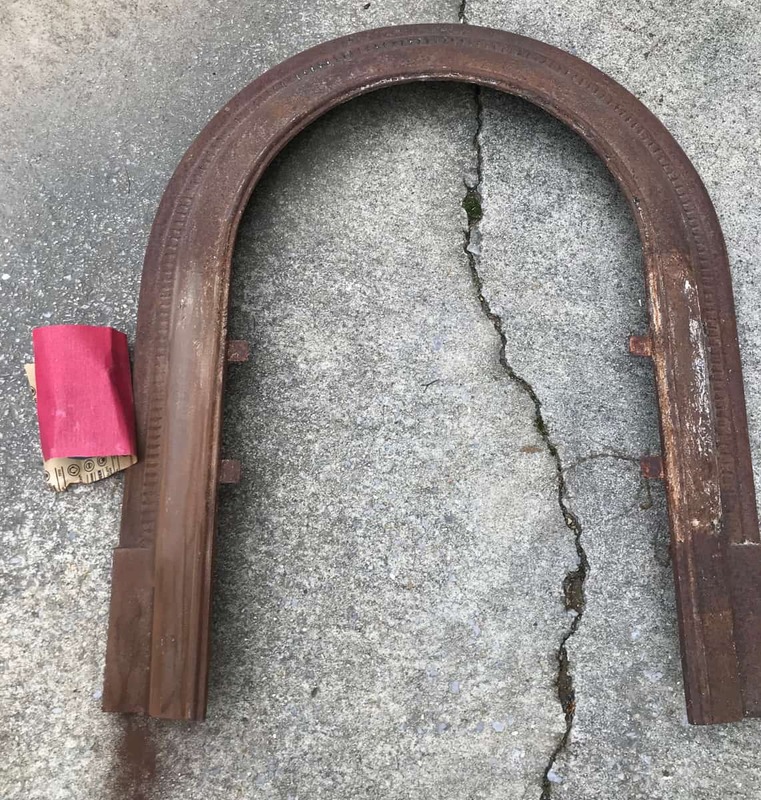 This antique arch purchased from Southern Accents & Architectural Antiques needed only a good sanding before painting. And then a coat of rust blocking primer. 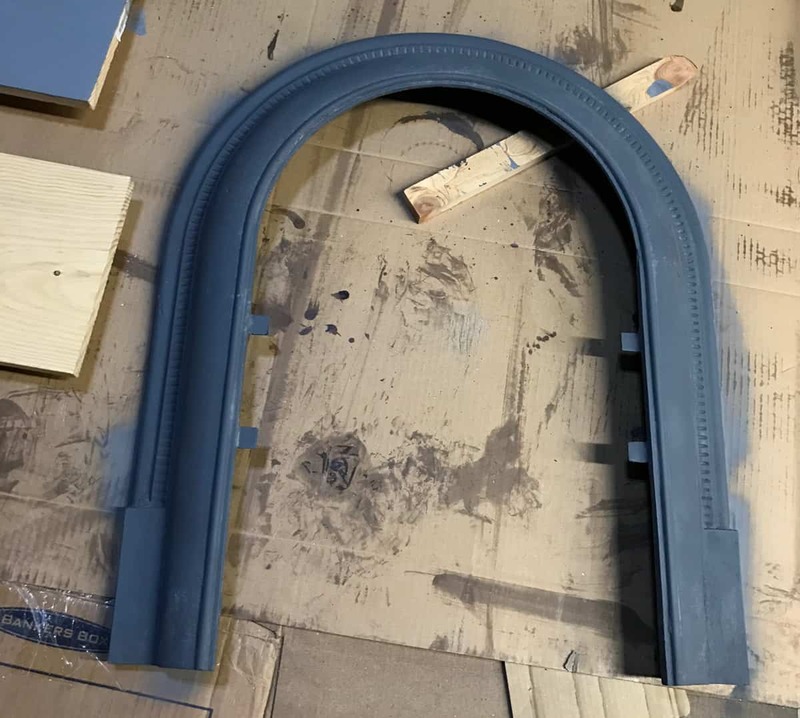 After receiving a coat of black paint, it is sitting in front of the primed built out area that will be tiled and embellished with moulding. I have ordered the tile for the threshold and expect it to arrive this coming week. In keeping with the history of the iron fireplace I chose the black hex marble. It is dreamy, right? Besides the potentially late arrival of moulding, I had one more little disappointment. The chandelier I ordered was not quite right. Clearly, I failed to space plan. The fixture is a good bit too large for the scale of the room. Thankfully this is an easy fix. Yes, it will cost me $16 to return it but that is better than a fixture that swallows the room. For future reference here is a handy formula for determining the proper scale of a light fixture or chandelier. Find the length and width of the room in feet. Add the dimensions together and then swap out feet for inches. That is the size of your fixture. For example, the library office is basically 12 feet by 12 feet. Add those together to get a sum of 24. The corresponding light fixture should be around 24″ in diameter. 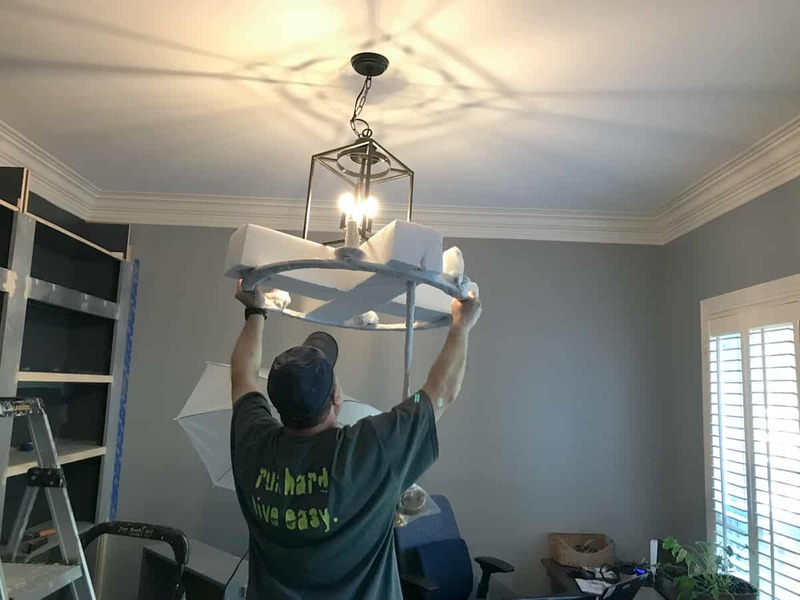 In this case, the 32 inch light fixture is a more than just a little oversized! I had hope to find one of similar style in a smaller size but had no luck. Everything else in this design was too rustic or too chunky. To remedy this situation I updated my design board with two options. Black or Gold? I’m likely leaning toward the black but the hit of elegance of the gold might be good too? Let me know what you think. Many of you commented on the chair I included. I’ll add the sources here for all of the products shown, but I should clarify that the chair in the design board is actually just a stand in for a chair we already own. It’s a little worn and needs some repair, but I am hoping it is going compliment the room even better than this gorgeous chair! More on that to come. The last little update I have is about the antique doors that will be at the entrance of the library. 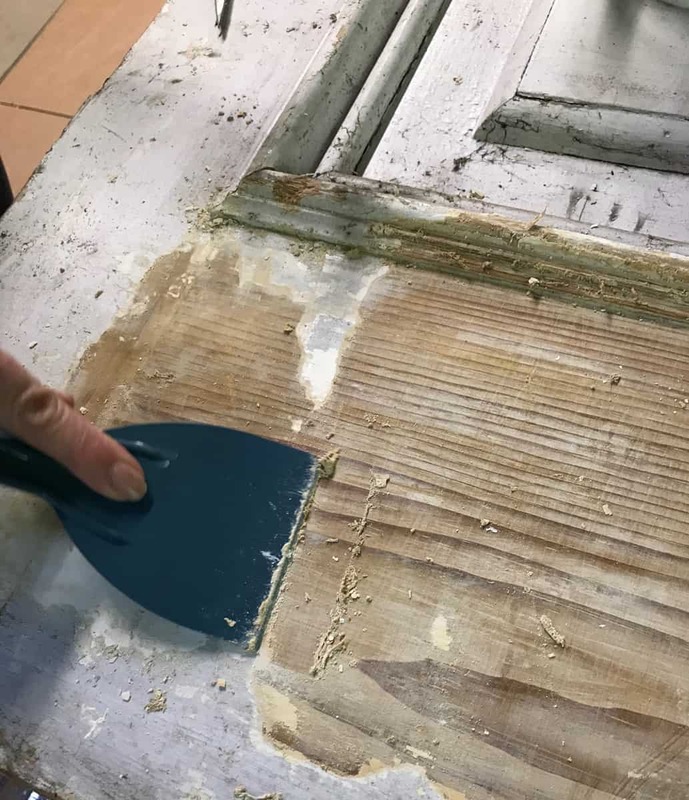 We tested the Peel Away product on two small sections and it looks like the numerous layers of paint will come off easily. I squealed when I saw the wood grain underneath!! Continue work on the doors and get them refinished on what will be the inside of the library and painted on the side facing the foyer. If the tile comes in on Monday and I hope to install and grout before the next update. The sconces will also be installed. My husband finished all of the electrical on Wednesday and they arrived then too. That will be an easy item to check off of the list. Please be sure to check in with the Featured Participants here and the other Guest Participants here. Everyone is deep in makeover mode and it is always thrilling to see the ups and downs of these makeovers. 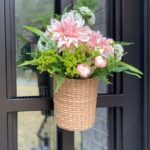 Thanks, as always, goes to Linda our host, House Beautiful and the Home Love Network for their support! Wowee! That wall is stunning! Thank you!! It is so satisfying when the vision in my head matches what actually comes to life! You have made so much progress! 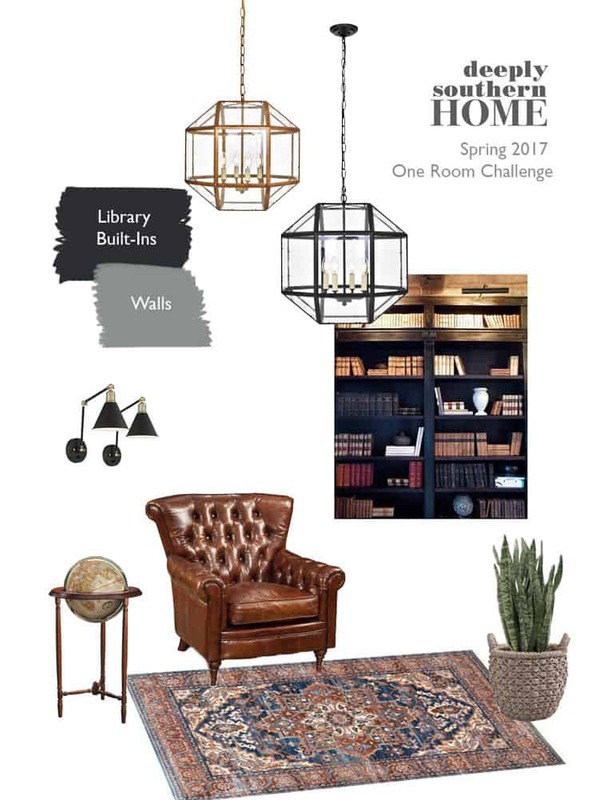 Your library space is looking amazing. That build out wall and fireplace area is just going to be fabulous. We have had our fair share of ups and downs already so we can share your pain LOL. 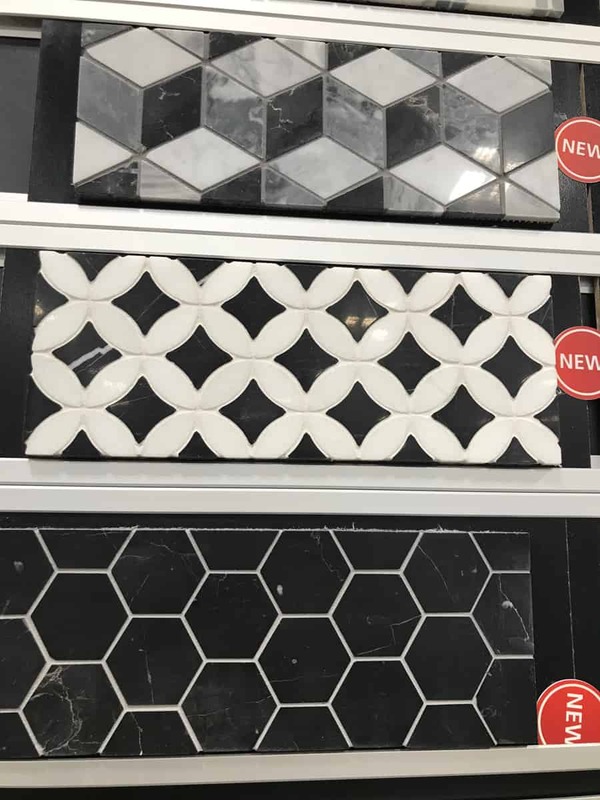 Love the black hexagon tile – we just installed white as a kitchen backsplash. Sorry that your light fixture didn’t work out but you have wonderful design taste – so we just know that what you choose will be perfect! Thank you so much. I should have been a bit more careful of my late night ordering! And not to worry I have measured for the new light fixture accurately this time! I vote gold light fixture. It would look so lovely against that beautiful built in wall! Thank you! I think gold is the right choice too! OMG, that wall looks stunning already! Can’t wait to see how it looks with the trim! Thanks! I can’t wait to see the trim too!! The built-in looks great! I am loving how the fireplace is turning out! Just wait! It’s going to get even better! Wow! I can’t believe how good this looks already! Well done! Thank you!! I am happy with how it’s progressing. I could not be more fired up about those gorgeous doors! 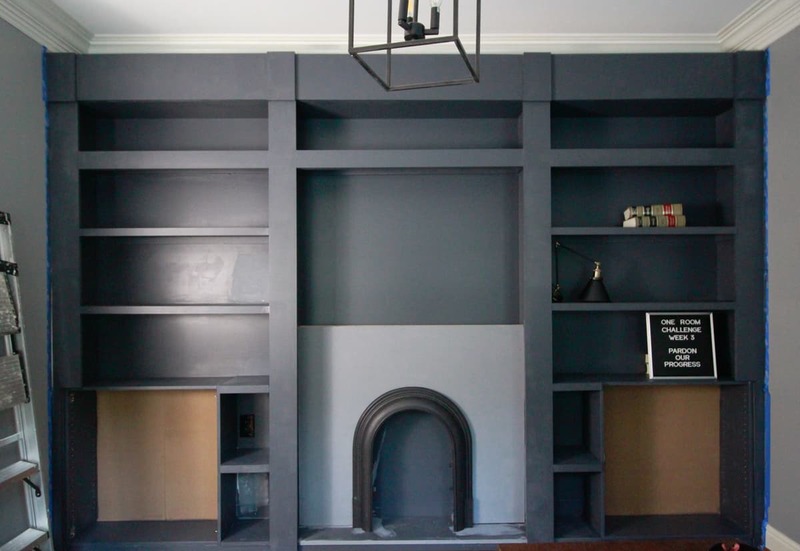 The built-ins and fireplace look so fantastic Leslie. 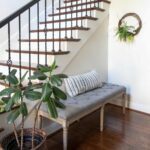 I’m voting for the gold light (especially against the color of your built-ins!!) but I think either way is a win!! Thank you! I agree about the gold. I have to convince the hubby it’s the right choice though. I also vote ‘gold’. 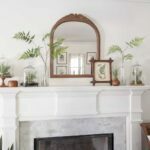 The sconces have a hint of gold, and they would look great together. 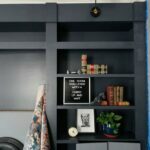 A gold fixture would stand out a bit more against the black built-ins. 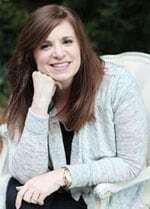 Leslie, you are doing a fabulous job! Thank you! That’s exactly what I was thinking. Now I have to convince the hubs that’s the right choice. Great minds think alike by the way. 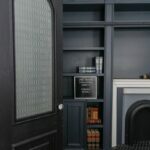 Great color on the built ins! Thank you! 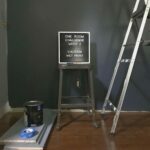 I love that it is a dark grey with heavy blue undertones. Your shelving looks so good! Thank you! Wait until you see it with all the moulding!! That wall is beautiful and I love the tile you picked!! I am partial to the hex tile too 🙂 My vote is for the gold light fixture, I think it would be a wonderful contrast to paint of the builtins. Thank you!! I am hoping the tile comes in soon! I cannot wait to see the tile -this is looking super impressive already! The antique arch!!! Picking my jaw up off the floor. This room is already looking amazing! Wow, I love how your room is coming together. The fireplace and build ins are looking great and I love the tile you chose. 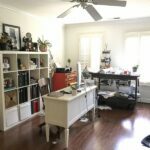 I can’t wait to see your finished space.